The imposing Sergeant Major Duncan of the Scots Greys, in full dress, pictured in 1898. From Real War Horses: The Experiences of the British Cavalry, 1814-1914. The 18th through 20th centuries produced a flood of treatises on the organization and tactics of cavalry and on the training of cavalry horses and riders. Countless public reports and private diaries, regimental histories and personal memoirs, intensified the deluge, as did a steady stream of disciplinary histories, particularly in the latter half of that period. Many of these works relied not only on the military experience and expertise of their authors, but also on disinterested research and rigorous thinking. Contemporary histories of cavalry generally fell into two overlapping categories. One category, written to educate and advocate, comprised general histories and, sometimes, future speculations, such as Lewis Edward Nolan, Cavalry: Its History and Tactics (1853); George Denison, A History of Cavalry (1877); Frederic Maude, Cavalry versus Infantry (1896) and Cavalry: Its Past and Future (1903); Friedrich von Bernhardi, Cavalry in Future Wars (1899) and The War of the Future (1920); and B.H. Liddell Hart, “After Cavalry-What?” The Atlantic (1925) and The Remaking of Modern Armies (1928). The second category, oriented more toward strategy and tactics and written to improve either or both of them, comprised case studies of cavalry action in specific wars and battles. Especially numerous around the turn of the last century, notable examples included Sir Evelyn Wood, Achievements of Cavalry (1897); General v. Pelet-Narbonne, Cavalry on Service, Illustrated by the Advance of the German Cavalry across the Mosel in 1870 (1906); Douglas Haig, Cavalry Studies: Strategic and Tactical (1907); Gustav Wrangel, Cavalry in the Russo-Japanese War (1907); and Alonzo Gray, Cavalry Tactics, As Illustrated by the War of the Rebellion (1910). A mounted drummer of the Scots Greys (about 1900). The richly embroidered drum banners and schabraque bear regimental devices and battle honours, including the thistle, the white horse of Hanover, and the French Imperial Eagle. From Real War Horses: The Experiences of the British Cavalry, 1814-1914. Once mounted cavalry receded into the past, it attracted a more academic and dispassionate kind of history. Works of this type range from the magisterial — notably, Marquess of Anglesey, History the British Cavalry, 1816-1919 (1973-97) — to the professorial — such as, Stephen Badsey, Doctrine and Reform in the British Cavalry, 1880-1918 (2008), David Kenyon, Horsemen in No Man’s Land: British Cavalry and Trench Warfare, 1914-1918 (2011), or Spencer Jones, From Boer War to World War: Tactical Reform of the British Army, 1902-1914 (2012). As those titles suggest, Anglophone works frequently treat British cavalry and often focus on the Great War of 1914-18. Works on mounted warfare during these three centuries, not surprisingly, also take up the details of breeding, purchasing, transporting, training, and caring for service horses. Since the great majority of horses served in transport and artillery units, contemporary historians and institutional recorders treated them primarily as resources — as invaluable but ultimately expendable sources of motive and tractive power — though memoirists and correspondents, particularly cavalrymen, also regarded them as fellow warriors. During and following the Great War, many historians and other writers adopted a more pronounced moral, and sometimes “sentimental,” tone, such as in Sidney Galtrey, The Horse and the War (1918), or David Tamblyn, The Horse in War, and Famous Canadian War Horses (1932). Recent work on the warhorse ranges from broad surveys, such as J.M. Brereton, The Horse in War (1976) and the more scholarly Louis A. DiMarco, War Horse: A History of the Military Horse and Rider (2008), to narrower studies, such as Ann Hyland, The War Horse in the Modern Era: Boer War to 2000 (2010) and the exceptionally well researched Graham Winton, “Theirs Not to Reason Why”: Horsing the British Army 1875-1925 (2013). Some handsome illustrated books have complemented them, such as Simon Butler, The War Horses: The Tragic Fate of a Million Horses Sacrificed in the First World War (2011), John Fairley, Horses of the Great War: The Story in Art (2016), or Lucinda Moore, Animals in the Great War (2017). Pen & Sword’s two new war horse titles. Anthony Dawson. Real War Horses: The Experiences of the British Cavalry, 1814-1914. Barnsley, South Yorkshire: Pen and Sword, 2016. 256 pages. 20 illustrations. Janet Macdonald. 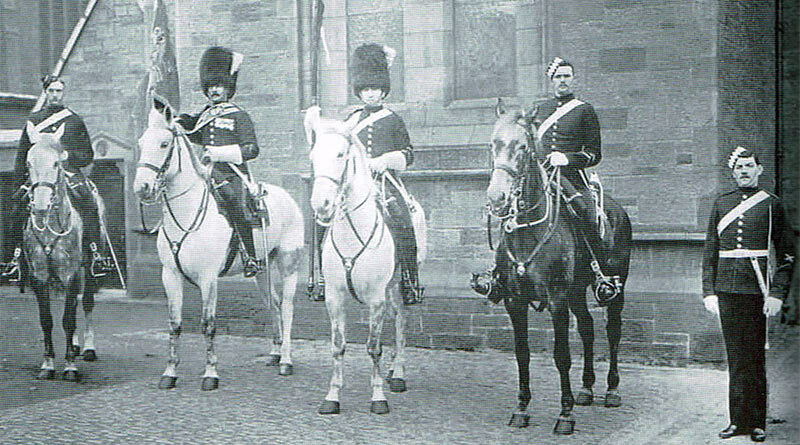 Horses in the British Army, 1750 to 1950. Barnsley, South Yorkshire: Pen and Sword, 2017. 224 pages. 30 illustrations. Pen & Sword, the British publisher of many of the books mentioned above, recently added two relevant titles to its impressive and catholic list: Anthony Dawson’s Real War Horses: The Experiences of the British Cavalry, 1814-1914 (2016) and Janet Macdonald’s Horses in the British Army, 1750-1950 (2017). While both books add value to the critical literatures on cavalry and warhorses, particularly with respect to the overlapping bodies of information that they cover, they differ considerably in conception and execution. Real War Horses, despite its odd title, actually focuses on a military arm and the men in its service, or, as its subtitle puts it, “the experiences of the British Cavalry” from 1814 to 1914. An excellent introductory chapter providing sweep and context, “Horse and Rider,” precedes a close and expertly drawn set piece on the iconic battle of Waterloo. The book then moves systematically through chapters on “colonial adventures,” the Crimean War, the Indian Mutiny, the Second Boer War, and the Great War of 1914-1918. This simple and solid design allows Dawson at once to survey a broad history, to study its key moments, and (its raison d’être) to conjure individuals experiencing those moments. An exemplary work of epistolary nonfiction, Real War Horses is based on “letters and diaries written by British soldiers serving in various campaigns and printed in contemporary newspapers.” The epistolary tradition in general includes a spectrum of work — some examples primarily comprising letters, with authorial tissue connecting them, and others primarily featuring authorial narrative, with letters embedded in it. Dawson nicely balances his authorial exposition with the testimony of his witnesses by increasing the ratio of the latter to the former over the course of each chapter. He has an intuitive feel for when to speak and when to let his subjects speak, and knows how to maintain a historian’s critical distance on letters neither disinterested, dispassionate, nor necessarily accurate. Pack horses in the First World War. Horses coped with deep mud much better than trucks. From Horses in the British Army, 1750-1950. A shrewd strategist, Dawson does not try to compete with either broad surveys or specialized studies, including many of those mentioned above (he draws on them, though, as well as on his primary sources). Rather than try to cover the whole of each conflict, for example, he instead focuses on a salient aspect. The strategy works very well, for example, when he centers his discussion of the Second Boer War on the formation and deployment of the Imperial Yeomanry, but less well, in my view, when he restricts his discussion of the Great War to the Western Front, and essentially ignores the far more important role of cavalry in the Middle Eastern campaigns. All in all, though, Dawson succeeds in giving an amateur reader the big picture, the professional reader new material, and every reader direct access to the minds of combatants. Horses in the British Army, 1750-1950, focuses on equines rather than men. It extends Dawson’s chronological length by roughly a century, adding the Seven Years War, Peninsular War, and Second World War, and it expands his topical breadth by leagues. Its 15 chapters range from the horsey to the institutional — from “The Nature of the Beast” to “Remount Department Administration” — as they cover the ground on “how [horses] were acquired, trained and cared for, and when no longer needed at the end of each war, what happened to them.” The book apportions its attention well between central topics, such as transporting horses, and peripheral topics, such as equines in non-combatant units. A pair of horses harnessed to a General Service wagon. Note the folded blanket under the saddle. From Horses in the British Army, 1750-1950. An expert on military (particularly naval) victualing, Macdonald also speaks with authority on other subjects: She has done her homework and knows her stuff. She has a keen eye for obvious points that one never may have considered, such as separating upstream and downstream activities in a camp; a good feel for matters that assume some knowledge, such as requisitioning experienced hunters as both leader horses and school horses in the field; and a refined taste for odd facts, such as that Lancers were expected to learn “fifty-five exercises,”including “twenty-two for use against cavalry.” Unlike some writers on warhorses, moreover, she not only speaks at length on the critical role played by mules in British service, but also touches on roles played by oxen, donkeys, camels, and elephants. Three authorial choices, however, devalue this wealth of material. First, Macdonald targets two overlapping but distinct audiences — readers, respectively, of military and equestrian subjects — so her treatments of many topics will be overly familiar to one audience and not engaging to the other. Second, Macdonald covers so much ground, while also packing in so much data, that her book often seems at once superficial and detailed: it wants more attention to the big picture in the text proper, and more relegation of evidentiary material to notes. Third, because her book is organized by topics and subtopics, rather than by chronology or argument, it develops neither a “story” nor a thesis: lacking such forward movement, it feels static rather than dynamic. Rigorous editing could have lessened those problems, and would have corrected the book’s lax syntax and shaky grammar. Filled with abrupt shifts in time, space, and focus, the book jumps confusingly from war to war and back again within and between paragraphs. And riddled with uses of the verb “should” (as command or advice) in present tense together with other verbs in past tense, it mashes up service manual and authorial voices — for example, “The animals should be loaded one at a time and tied to the line furthest aft; once all the animals were aboard, their rations, nose-bags and buckets could be loaded.” Constant overuse of passive voice, copulas, and pleonastic constructions (such as sentences beginning with “there are”), finally, flatten the book’s prose. In short, Real War Horses offers an abundance of clearly organized and artfully selected primary material in a brisk historical narrative; Horses in the British Army offers an abundance of well researched and informed material in a slack and dilatory compendium. Both books are rewarding; one is compelling. From Real War Horses: The Experiences of the British Cavalry, 1814-1914.